Two tails. Dark gray wings with strong dark mottling. Body is dark olive brown to purplish black. Late spring from mid-April through early June. Duns emerge during mid-morning hours. Spinners fall in the evenings. Medium to fast water with gravel or rocky bottom. Very common on most sections of the Henry’s Fork. Late season species are also common on the Madison, Gallatin, and some waters in Yellowstone Park. 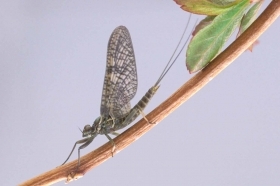 March Browns provide exceptional dry fly fishing on the Henry’s Fork in May and early June. They are classified as clinger nymphs. Transformation from the nymph to the dun usually takes place under the water. Therefore, a soft hackle emerger fished deep can often bring good results. During cooler weather the duns will stay on the surface long enough to provide good dry fly action.